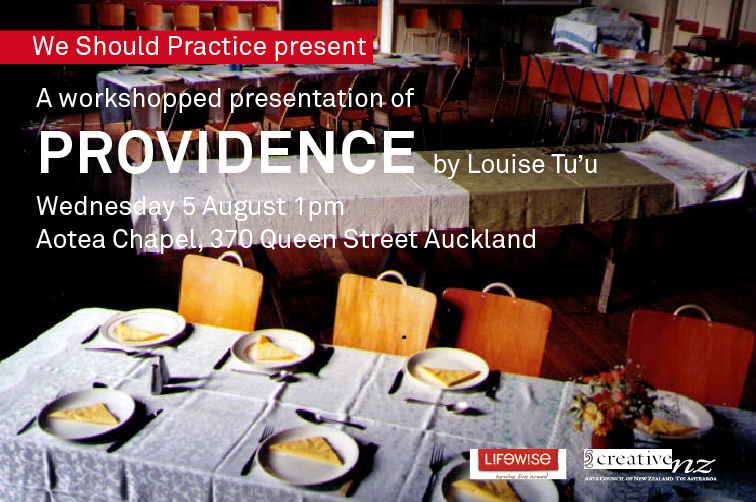 We Should Practice presented the workshopped draft of the play “Providence” on Wednesday 5th August, 2009 at the Aotea Chapel, 370 Queen St, Auckland. An audience of over forty homeless people, Lifewise pastoral and social workers and an urban secondary school class of Pacific Island youth at risk was present. The play was truthfully received, in the form of a homeless heckler and foot traffic, freely flowing in and out of the performance. Thanks to Lifewise and Creative New Zealand.